The colors below represent our standard ink and foil colors. On-screen representations will vary slightly from the printed pieces. To see printed samples, visit your nearest Smock retailer. Custom inks and photo printing are also available. Invented in the 1400’s by a German printer named Gutenberg, letterpress is the oldest printing process on the planet. Letterpress began as printing for the masses; it was how people once printed their books, their broadsides, their manuals, their pamphlets, their newspapers. Letterpress isn’t the easy way to print. Constant interaction is required between the pressperson and the press. Our presses are both finicky and old. But it’s worth it, because the final product is heavy with human warmth and uniqueness. 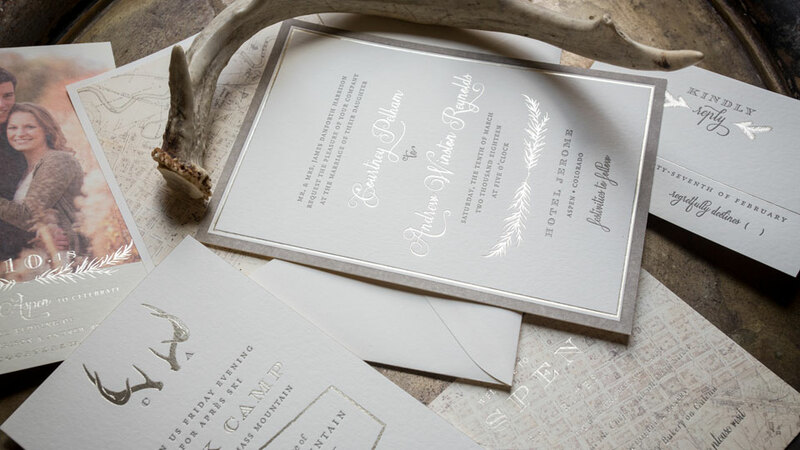 We love how foil stamping, like letterpress, draws on history. Think ancient texts adorned with with lavish gold accents, or leather book covers hand stamped by monks. Some say the process stems back to ancient Egypt, where Egyptians pounded gold thinner than thin and used it to beautify mummies for burial. Today, foil stamping uses a combination of heat, pressure, and metallic paper, and creates a beautiful impression with a bit of added shine. Digital printing allows us to add lots of colors to our designs. Unlike letterpress and foil stamping which can only print one color at a time, digital printing presses provide an array of colors all in one go. Though it’s a newer printing method, the quality and flexibility of digital printing has improved dramatically, and can now be used on thicker, unique stocks like our luxury smooth cotton.